Women were a majority of the U.S. Olympic Team, and they took home a majority of the country’s medals, en route to a dominating performance across the board at the 2012 London games. 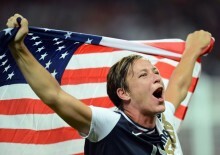 Women won 56 percent of the overall medals for Team USA, and 66 percent of the gold medals. US Women won team gold in soccer, basketball, beach volleyball (they also won silver), gymnastics, the women’s 4x200m freestyle relay, rowing, the women’s 4x100m medley swimming relay, tennis doubles and the 4x400m track relay. Posted August 15th, 2012 & filed under News, Sports.